THE BOTTOM – “Being in this election, it has not been easy, especially being the youngest person. I appreciate those who have congratulated me and those who remind me regularly of how brave it was for me to get involved”, said Esmeralda Johnson, number seven on the Windward Island People’s Movement list (WIPM). Twenty-one-year-old Johnson made history as the youngest female candidate to ever take part in Saba Island Elections. Johnson graduated from Lindenwood University last year, with a bachelor’s degree in Mathematics and a minor in Economics, determined to center attention on education, empowerment of youth and women as well as sustainability throughout campaigning. “Several candidates have given me plenty of words of encouragement and offered help multiple times and I am proud to be a part of a powerful political party such as WIPM”, said Johnson. The community is surprised that a young woman took on the challenge to enter into a male dominated field. “I think people would support that she has been given an opportunity and would want accountability. As a community, we would need to follow-up with her to make sure she holds true to her commitments she’s made”, ended Charles. On March 20, residents of Saba will vote for their representatives in the Island Council and Electoral College. The Island Council is composed of 5 elected people’s representatives. The Island Council supervises the island’s Executive Council, which is composed of a lieutenant governor and commissioners. 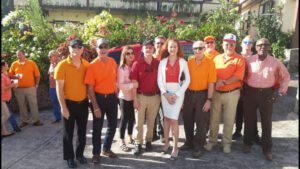 For the first time, persons on Saba with the Dutch nationality will be voting for the Electoral College. The Electoral College will vote for the members of the First Chamber, the Senate, together with the Provincial States.